We now have 45 active Brue Boys after two new members joined us in October (with two more having a sabbatical year) and on 29th October a record 40 men attended the Monday evening rehearsal at The Stalls. Six 'old boys' who have left the choir are joining us for a special 2019 performance yet to be announced. Grayson Pattemore is the first of these to join rehearsals. His dulcet tones and wit are most welcome again on the back row of the basses. The final 2018 practice will end with seasonal refreshments on Monday 17th December and we will resume in the new year on Monday 7th January. With a gap until our next concert in 2019, we are busy learning new songs. These include: Wagner's Pilgrims' Chorus; the Russian folk song 'Kalinka'; a stirring Welsh hymn 'Ebenezer'; a medley of well-known songs from the musical 'Oklahoma' and the Somerset folk song 'O Sally My Dear'. Practice parts for 'Sally', 'Ebenezer' and for all four Oklahoma Medley songs are now available on the Practice Parts Page, as is Bobby Shafto for those new to the song. For a complete list of our repertoire see the Our Music page to get an idea of the wide variety of songs we sing. on which the choir will stand. The committee was re-elected en bloc and thanked for their work. Geoff Gingell has taken over Librarian duties following Paul Oddie's move away from the area. See also Officers page. Subs for 2018/2019 of £65 should be made to Treasurer Roger White. Conductor Jennifer Westcott reviewed the successful 2017-2018 year and looked forward to preparing for future concerts as the choir continues to expand its repertoire and seeks to further improve performances. A very special 2019 event performance is expected to be announced soon. We continue to welcome new members. Email our Conductor Jennifer Westcott on jennifermmsing@yahoo.co.uk to find out more. 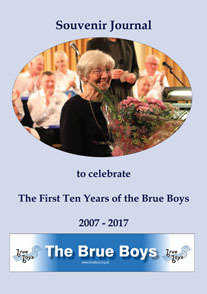 The Brue Boys performed a sell-out concert at the new venue of St Paul's Church in Easton on Friday 30th June - see the 2018 Concerts page for a report and photos. .
Andrew Look again organised a highly successful annual dinner at Long Sutton Golf Club on Friday 23rd March. See the 2018 Dinner page for more. Andrew has already booked the same venue for the 2019 annual dinner, which will be held on Friday 8th March. Master of the Wardrobe Nick Llewellyn supplies smart shirts, sweatshirts and fleeces for choir members, all with the Brue Boys logo. Details are now also available on the website: see the Uniforms page for more. see below for a report and more photos. During the performance there was a great deal of audience participation which was a good indicator that music is really enjoyed at Avalon School. for both our visit and the donation made to the school of £600 for music projects. An experience to be remembered by all present. A near capacity audience of the pupils at Butleigh Primary School were entertained by the Brue Boys conducted by Jennifer Westcott and accompanied by Hilde Senior. The programme consisted of ‘When the Saints’, ‘The Trolley Song’, ’John Kanaka’, and ‘Hand me down my Silver Trumpet’. All were chosen to provide the opportunity for the children to participate and they certainly took that opportunity! After benefiting from a ‘warm up’ directed by Jennifer they joined in with great gusto. An enjoyable experience for the children and for the Brue Boys. - these are available at £10 each from Treasurer Roger White. and the project is already in profit of about £100. - the quality of the sound makes a huge difference and Hilde looks forward to its first outing on 17th February during the Baltonsborough Concert. The photo right shows Nick Llewellyn enjoying setting it up!